Dump, curate, KISS, and Eisenhower: Do Now, Do Next, Deal, Dismiss. Last week’s recap: put down the chips, back away from Netflix. I didn’t give you homework, but I hope I gave you something to think about. But this week is play-along-at-home! You’ll need: a writing implement and a writing material. Yes, you can use your phone. I prefer pen-and-paper but whatever works works. Music is fine; so is quiet. Either way, you’ll need a place to think/work where you’ll have some time without distractions. I’m gonna call that ‘the kitchen table’ just to make it easy on myself (am lazy, remember). That, my friend, is the start of what I call decision fatigue. It’s a sliding scale; some days you can go further without the fatigue setting in; some days it’s all you can do to decide what to wear. When I get stressed my ability to handle decisions—even tiny decisions like “lunch” become overwhelming. Once I recognized that about myself, though, I could start to take steps to handle it. Routine helps; setting up a daily schedule ahead of time so that I know that on Tuesdays I update my blog and every morning before work I take 15 minutes to do my bullet journal while I have my coffee keeps me grounded, and lets me “spend” decision power on other things. It’s all about works for you. But to get there I had to figure out what was keeping me stuck. You’re at your kitchen table. Take a deep breath, and think of allll the things that are flying around in your brain, and start to write them down. Worried about nuclear war? Write that down. Want to start a novel? Start by writing out that thought. Ought to exercise more? Use the pen to write the words. Don’t write the list for anyone but yourself: no one is going to see it but you. Wish you could hang out with your friends more? That’s a thing to go on the list. Become speaker for the UN? Thinking big! I like it. Write it down. Keep going, dredging like a shady fisherman, until you scrape the oceanscape of your mind clean. Pick out all the wriggling thoughts and throw ’em in a bucket (yes I am continuing with this metaphor). No shrimp too small, no dolphin too large (I am so, so sorry). Your list is probably pretty messy. So we’re going to clean and organize it. We’re going to write each item down again, this time with a number (not a ranking, just an itemized number. Don’t worry about prioritizing yet). But—and this is why we didn’t number things to start with—we’re going to ask a question each time. Namely “is this an action?” Because chances are, your list will have some things on it that are not yet goals. “Be in shape”, “worried about an overgrown cheetos-dust-covered toddler wreaking the planet”, “why doesn’t my dog like me any more”–these aren’t actions; they’re states. And confusing the two keeps them from being something you can do anything about. So for each item on your scribbly page of thoughts, ask yourself how to turn it into a specific verb that fits on a to-do list. The first time you do this will be a lot of work and soul-searching. But each time it gets easier. And if you build it into a routine—every Sunday night for the week, say, or each morning—it becomes faster and simpler and you can combine steps until eventually you reach a point where the dumped thoughts come out the pen curated. But for now, do it the long way. It’s worth it. Stands for Keep It Simple, Sweetheart (or Stupid, but let’s keep it positive). I learned it working in a print shop; our learned default is to do a job in the order that it’s in the queue but if it’s a small, 5-minute task maybe it makes more sense to get it out of the way so that you can focus on the bigger items. Anything that can be done in one action and doesn’t take very long. 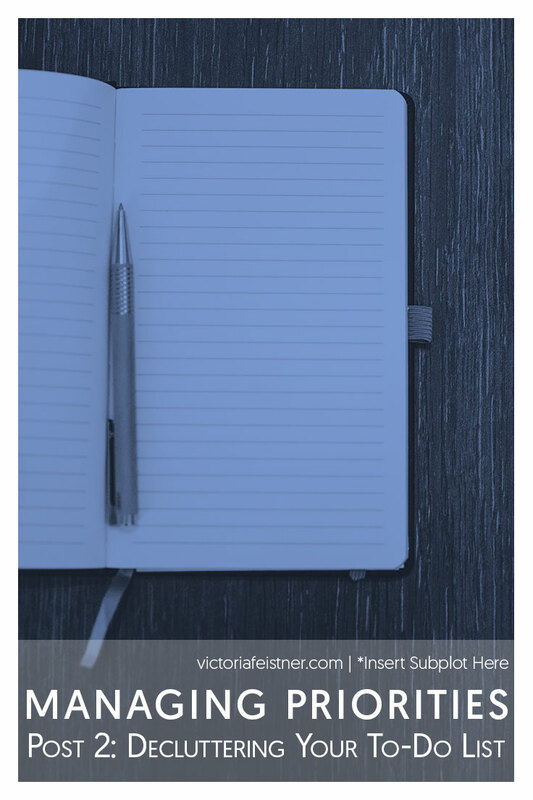 How I like to apply it to my Action Plan is to go through my itemized list (which, remember, still isn’t prioritized) and put an asterisk next to each task or verb that you think will take less than one Unit to complete. (We haven’t gone into Units yet so let’s just use 15 minutes for now.) If you want to wash the dishes every day instead of letting them build up in the sink, that’s a task that can use an asterisk. If you want to stay on top of your emails every morning, that may be an asterisk but might not be. “Researching methods for dog happiness” sounds bigger than a 15 minute job so leave that one alone. And so on. Probably most of your items are bigger than 15 minutes but I bet at least some of them aren’t. Set that paper aside for the moment. It’s time to draw some squares. 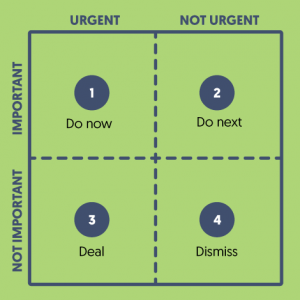 The Eisenhower Matrix has different names like The Urgent-Important Matrix and it has websites devoted to it and powerpoint presentations and propitiatory software. Don’t let the internet overwhelm you. 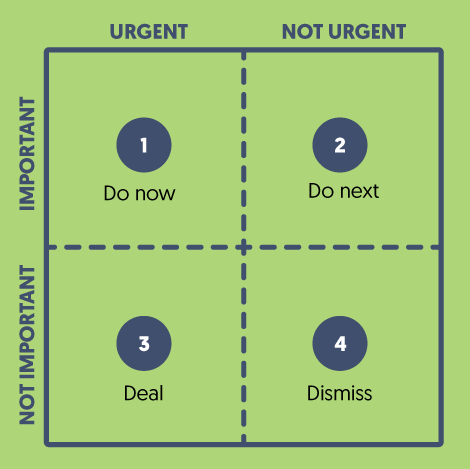 It’s a square divided into 4 boxes and it is very, very powerful for figuring out your priorities in life provided you ask yourself some hard questions. I’m going to bet a good portion of the items on your list are things you feel you ought to do. Maybe you promised a friend or coworker; maybe society is pressuring you. But because you don’t actually have an internal drive to do those things, they don’t get done, and then they hang around in your brain and clutter your mental workspace. It’s time to force them onto a piece of paper and demonstrate to yourself exactly what you should work on next to get to where you want to be. Note: “IMPORTANT” means IMPORTANT TO YOU, not your boss or your spouse or your parents or society at large. If “helping your boss finish his TPS report” advances your career, then do the work because “advancing your career” is what is important TO YOU. Figure out if these things are FOR YOU or for someone else. Too often we get stuck worrying about things that are important to other people, not necessarily to us, and spend our time on them instead of what makes us happy. Draw a box. Subdivide it into 4 equal squares. Label top left: IMPORTANT AND URGENT. Top right: IMPORTANT BUT NOT URGENT. Bottom left: NOT IMPORTANT BUT URGENT and bottom right: NOT IMPORTANT AND NOT URGENT. Go through your list, item by item, and write the number in the square it belongs. IMPORTANT AND URGENT (“Do now“): these are things that you really want to accomplish, that will get you out of bed in the morning, that also have a time-based component. No one can make that decision but you. IMPORTANT BUT NOT URGENT (“Do next“): calling a loved one or going on a hike or redesigning your blog. Things that make you happy but they can be fit in around other things in your schedule or your mood. UNIMPORTANT BUT URGENT (“Deal“): We all have jobs and tasks that keep the peace. Thanksgiving is coming up and you told your spouse you’d bake a pie! You want to do the nice thing for your spouse and their family because you like them but you don’t actually care about baking all that much. This is about honesty, and remember no one needs to see this list but you. UNIMPORTANT AND NOT URGENT (“Dismiss“): all those unfinished crafting projects in the closet. You know the ones. Sure it would be nice to finish them one day but is it worth worrying about in the meantime? Be honest. Ask yourself hard questions. If EVERYTHING ends up in Important and Urgent then you need to go back and redo and ask yourself what really, truly, you want to do with yourself. Because if everything is a priority then nothing is; and that’s how you ended up bogged down in decision fatigue in the first place. Once you’re done, it should be pretty clear what you should be focusing on: DO NOW. You can start to plan your day/week/month around these items. Once you get those things underway, you can move on to DO NEXT. And remember your KISS asterisk items? Anything in there that ends up under DO NOW or NEXT gets done first. UNIMPORTANT BUT URGENT is often called “DELEGATE” but I think it would be better called “DEAL” in civilian life. Maybe you don’t have time to bake a pie from scratch. Would your in-laws be okay if you bought a pie instead? Can a friend or a partner help you out? That sort of thing. Again, the items in this box are by definition not important to you; so it’s okay to instead figure out alternatives that make everyone happy. UNIMPORTANT AND NOT URGENT really should be “DISMISS“ed and left off the schedule entirely. When you have free time and are in the mood to tackle completing them, go for it! But otherwise let them be. You’ve got better things to worry about. There. You’ve got an organized set of priorities. Doesn’t that feel better? That’s half an action plan! 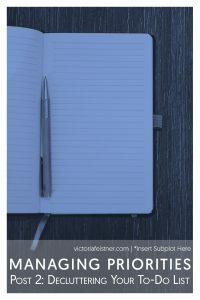 7 Comments for "Managing Priorities #2: Decluttering Your To-Do List"
This is super useful! It really helps solidify the nebulous cloud of ideas I have rolling around in my head.